Preheat oven to 180°C (355°F). Place the peaches, sugar and vanilla in a bowl and toss to coat. Spoon into a shallow 28cm-round ovenproof dish. Place the extra sugar and flour in a bowl and mix to combine. Add the butter and use your fingertips to rub it into the flour mixture. Add the coconut and almonds and stir to combine. 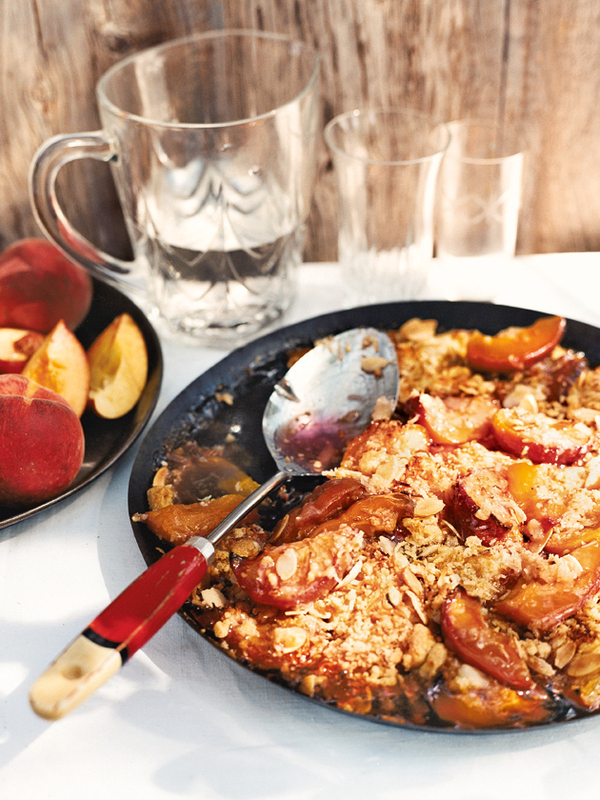 Spoon on top of the peach mixture and bake for 40 minutes or until golden and crisp. Serve warm with cream or ice-cream. Serves 6. This has become a family favourite - the coconut and almond crumble is gorgeous. I also change it up with half peaches and half nectarines - and for a healthier alternative I halve the amount of sugar added to the fruit which is fine for my family.